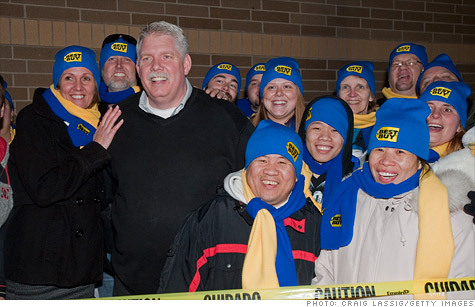 CEO Brian Dunn, seen here with Black Friday shoppers in Minnesota last year, was in an inappropriate relationship with a coworker, Best Buy said. NEW YORK (CNNMoney) -- Best Buy on Monday said an investigation revealed that former Chief Executive Officer Brian Dunn engaged in an inappropriate relationship with a female co-worker. Dunn, who stepped down as Best Buy's (BBY, Fortune 500) CEO in April, "violated company policy by engaging in an extremely close personal relationship with a female employee that negatively impacted the work environment," according to the company. Best Buy's board of directors said that Dunn's relationship "demonstrated extremely poor judgment and a lack of professionalism." But the company said Dunn's conduct did not involve "misuse of company resources" or "misuse of aircraft." Best Buy said Dunn will receive a severance package totaling more than $6.6 million. The package includes severance pay of $2.85 million, stock grants worth $2.54 million, a "previously earned" $1.14 million bonus and $106,700 in unused vacation pay. Dunn, for his part, cannot take a job with a Best Buy competitor for three years. Standard company policy is one year for non-compete clauses. The company also said that its chairman, Richard Schulze, was stepping down, effective June 21. Best Buy's board said that Schulze "acted inappropriately" by not informing the board's audit committee about Dunn's allegations back in December, when he found out about it. In the company's statement, Schulze said: "I understand and accept the findings of the Audit Committee." Schulze will be succeeded by Hatim Tyabji, a director since 1998. Best Buy has had a rough time of it financially, with its bricks-and-mortar retail operations struggling to compete with online retailers. Best Buy announced in March that it would close 50 stores in the U.S.
Shares of Best Buy stock rose nearly 2% in morning trading, on a day when the rest of the market was sharply lower.